Fax Fx is a leader in the supply of internet fax technologies. We command a large market share in the provision of fax to email solutions and utilise a front-line B2B and B2C faxing software platform. This innovation in the way faxing is accomplished, is as suitable for individuals as it is for large, office based companies. 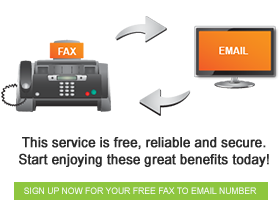 Fax FX free fax to email services provide individual users with a host of benefits. Our corporate clients benefit greatly from the increased productivity, efficiency and control that our free Corporate free to email services afford them. Registering your entire company for our free fax to email is as simple as filling out a form, giving you the power to supply every employee with an individual fax number absolutely free of charge. Going green is easy with Fax FX. At average, in South Africa, a fax machine recieves approximately 15 pages every day. These faxes are photocopied or sent elsewhere to be printed again. A single tree produces about 8333 sheets of paper, we can therefore estimate that fax transmission and copying in South Africa consumes 355 579 trees every year.